RTÉ HAS SAID it received a number of formal complaints about Friday night’s Late Late Show, which stirred up some criticism online. 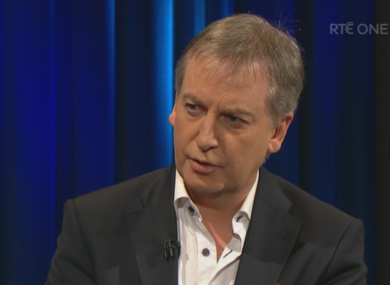 During the show, host Ryan Tubridy spoke to crime correspondent Paul Williams about the gangland feud that has seen two people gunned down in Dublin in recent weeks. While on air, Williams profiled the big players in the current war between two families – the Kinahans and the Hutches – and gave background on how it all began. He described David Byrne, who was shot dead at the Regency Hotel in Drumcondra earlier this month, as “a thug and a criminal”. Eddie Hutch, who was shot dead at his home in retaliation was “totally innocent”, according to Williams. Towards the end of the interview, the crime correspondent turned his attention to the topic of the Special Criminal Court, which he said was the State’s “most important weapon” against this type of crime. The existence of the court, which allows certain crimes – like those perpetrated by gangland figures – to be heard by judges without a jury, has been debated during the general election campaign. Sinn Féin has been clear about its wish for it to be abolished, citing human rights as the reason. “The only people who will vote for Sinn Féin, in regard to that part of their manifesto are the drug dealers, the killers and the kidnappers and the terrorists,” Williams told Tubridy, who tried unsuccessfully to deflect the conversation. A spokesperson for RTÉ told TheJournal.ie that, since Friday night’s programme, its information line has received 19 calls and 11 emails from viewers offering feedback on the show. “A number of formal complaints have been received and RTE will respond to the complainants within 20 days,” they said. To put that in context, last Friday night’s programme is the most watched non-sporting TV broadcast of the year so far. It attracted an average audience of 661,600 people. The show was the third most watched Late Late of the season, coming in behind The Late Late Toy Show and the Country Special. The Broadcasting Authority of Ireland also said it received nine contacts in relation to this broadcast but no formal complaints were lodged. Email “RTE receives 'a number of formal complaints' over Friday's Late Late Show”. Feedback on “RTE receives 'a number of formal complaints' over Friday's Late Late Show”.